WASHINGTON, DC –On November 22, 2018, Juris Prudence LLC will release, Juris P. Prudence’s Holiday Gift. 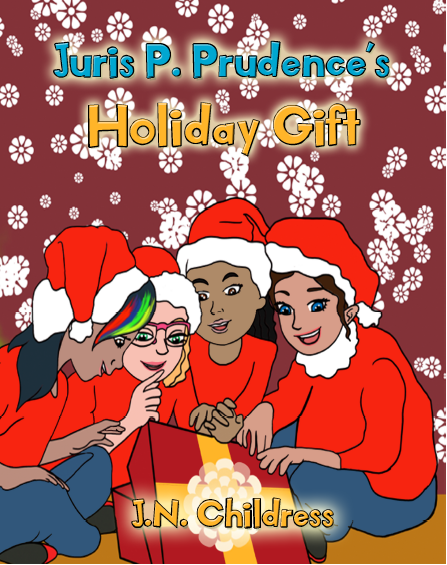 In Juris P. Prudence’s Holiday Gift, eleven-year-old lawyer Juris (“J.P.”) Prudence notices that people in her community have not been nice to each other this year. During her train ride to school, J.P. is saddened to see her neighbor calling someone a mean name on the train. Over the course of the day, J.P. sees her community members displaying other acts of unkindness, and she decides to do something about it. Inspired by a homework assignment from her law school professor, J.P. uses the law of contracts to make her community promise to be nice, be kind, and be great. “Over the past few years, the news has been filled with stories of violence, cruelty, and acts of intolerance. I wanted to create a book that reminds us all, adults and children alike, of the importance of showing kindness to the people that we interact with on a daily basis. Juris P. Prudence is a caring, eleven-year-old lawyer who wants to use the law to help her community. I hope that this book will be a way to use literature to teach children about legal principles, such as contracts, but more importantly, about how the world really needs more acts of kindness,” says Childress. The book will be available on Amazon.com. Author-signed copies can be purchased on the Juris Prudence website (www.jurispprudence.com). A companion workbook, Juris P. Prudence’s Kindness Contracts, will also be released on November 22, 2018, comprised of kid-friendly fillable kindness contracts, that contain fun contracts promising to volunteer in the community, to be kind to others, to respect the property of others, and more. A percentage of all December 2018 proceeds from the sales of Juris P. Prudence’s Holiday Gift will be donated to the Legal Aid Justice Center, based in Charlottesville, Virginia. Founded by attorney, Jessica Childress, Juris Prudence LLC is a Washington, D.C. based children’s content company that produces educational content teaching children about the law. For more information about Juris Prudence LLC, visit www.jurispprudence.com.